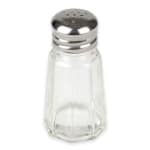 The American Metalcraft PNS13 shaker is 3 inches tall and has a capacity of 1 ounce, making it perfect for holding salt, pepper, and other fine-grained seasonings. Its paneled glass body provides customers and staff members with a clear view of the product. The mushroom-style cap gives the American Metalcraft PNS13 salt/pepper shaker a classic look that fits into almost any décor. The stainless steel top resists corrosion and minor damage.